An email discussion with environmental journalist Stephen Leahy prompted me to look into the amount of fugitive methane emissions from the natural gas industry in NE British Columbia. The data on various BC Government websites are not easy to reconcile, so, on March 18th 2013, I wrote an enquiry on the query form provided at the website of the BC Ministry of Environment. I have an enquiry about how you calculate emissions of methane and CO2 from natural gas operations in BC. In this document, you give the figure of 108 kt of methane and 3198 kt of CO2 for 2010.1) How is the 108 kt figure for fugitive methane emissions in 2010 calculated? 2) What percentage of methane produced in BC is vented deliberately and/or accidentally to the atmosphere? 4) How do you reconcile the 3198 kt figure for vented CO2 with the rather higher numbers in the GasNew.xls sheet? I calculate approximately 2.2 billion cubic metres of CO2 vented or 4400 kt (I assumed that “acid gas” on that spreadsheet is mostly CO2, but there may be a substantial portion of it that is H2S, which may be the reason for the discrepancy, but I have been unable to find figures for the total amount of H2S produced in BC). 5) I note that you calculate the GHG equivalence of methane in terms of CO2 using a factor of 21, which implies a reference time of 100 years. The last IPCC Report, AR4, uses a factor of 25. Recently, some researchers have argued that a shorter time interval and a much higher GWP factor would be more appropriate. Is the BC Government contemplating any change to its methods for accounting for methane emissions? 6) Are there any plans to measure methane fugitive emissions more accurately? Best regards, Andrew Skuce P.Geo. I received no reply. On April 12th, 2013, I wrote again to climateactionsecretariat@gov.bc.ca. I wrote to you at this address ‘GHGInventory@gov.bc.ca’ on March 18 with the message that I have appended below. I have received no response. If it is more convenient for you to discuss this over the phone, I would be happy if you called me. I am preparing an article for publication in a newspaper and/or blog that will discuss BC’s fugitive natural gas emissions in the framework of climate change and the reassessment of fugitive emissions that is going on in the United States. Obviously, I would prefer not to have to speculate (or rely on third-party reports) about how the BC government is addressing this issue and what its future plans are. This issue obviously has implications for BC meeting its legislated greenhouse gas targets as well as for the planned expansion of natural gas production and LNG exports. I would prefer to assume that the government is taking this matter seriously. On April 20th, 2013, I received a lengthy and helpful reply from the Ministry of Environment. I reprint this below, with some reformatting to aid the legibility of the tables and with added hyperlinking of web references. There is an unreformated copy-and-paste version here. My questions are in bold text. I added question 6), assuming that the last paragraph of the email was a response to that question. My additions are in square brackets. Andrew Skuce, in response to your query. Attribution to Ministry of Environment. 1) How is the 108 kt figure for fugitive methane emissions in 2010 calculated? BC produced approximately 41,441,000 thousand cubic meters of gas in 2011 ( Table 3.9b, page 97 of the handbook) and had natural gas fugitive and venting greenhouse gas emissions of 4.38 Mt CO2e (Greenhouse Gas Reduction (Cap and Trade) Act Reporting Regulation data available at: here and summarized below. Of the 4.38 Mt CO2e, 2.408 Mt is venting of carbon dioxide in acid gas removal and is therefore not venting of methane, leaving 1.972 M CO2e t of methane venting. If the full amount produced in 2011 was vented to the atmosphere, approximately 590 Mt CO2e would be released. Actual venting and fugitive methane emissions are therefore around 0.3% of total methane production. So for 2011 data, the percentage actually vented is approximately 0.3% of the total amount produced. 5) I note that the GHG equivalence of methane in terms of CO2 uses a factor of 21, which implies a reference time of 100 years. The last IPCC Report, AR4, uses a factor of 25. Researchers now say a shorter time interval, i.e. 20 years and a much higher GWP factor would be more appropriate. Is the BC Government contemplating any change to its methods for accounting for methane emissions? BC follows Environment Canada and United Nations Framework Convention on Climate Change (UNFCCC) inventory protocols which currently mandate use of the Second Assessment Report (AR2) Global warming potentials. Revised UNFCCC reporting guidelines will be in effect internationally starting with the 2015 submission of 1990-2013 inventory reports (subject to a UNFCCC decision in late 2013). Given the importance of international standardization, British Columbia will follow the same timeframe and approach. Please note that this include only an update to the 100 year GWPs and does not include a switch to use of 20 year GWPs. BC has published complete and detailed 2011 oil and gas emissions data calculated using prescribed quantification methods here and in majority verified by third party verifies from the Greenhouse Gas Reduction (Cap and Trade) Act Reporting Regulation . Emissions by specific oil and gas source in tonnes of CO2e are provided here ) (see the answer to question 31. What are the emissions from the different oil and gas sources in British Columbia?). Given that this data was obtained through regulatory reporting, uses prescribed quantification methods and is (in vast majority) third party verified it is believed to be more accurate than the top-down methods used in the Provincial and National Inventory Reports. We are exploring recalculating the oil and gas line items (among several others) in the Provincial report using the Reporting Regulation data. My questions 3) and 4) were not answered, probably because they referred to apparent discrepancies between figures used by different government agencies, the BC Oil and Gas Commission and the Ministry of Environment. I will look into this in more detail in the future. Estimated fugitive and vented methane emissions from oil and gas operations in BC amount to just 0.3-0.4% of the volume of gas produced. BC relies upon fugitive emission numbers provided directly or indirectly by industry. A summary of peer-reviewed studies of methane leakage in the US natural gas industry is shown in the following table. From the report Clearing the Air showing percentage methane fugitive emission estimates for the US natural gas industry. Note that all of the estimate ranges exceed the BC Ministry of Environment estimate of 0.3-0.4%. It is worth noting that the claimed BC fugitive emission rate of 0.3% is approximately one-eighth of the 2.3% estimate made in 2011 by the Environmental Protection Agency for the US natural gas industry. Ranges in the peer-reviewed literature for fugitive emission rates of methane in the US range widely, from 1% to 8%, and there is an active research program under way to try to narrow this range, with results expected in late 2013 and in 2014. In the 2012 World Resources Institute report Clearing the Air, a 1% leakage rate for the US industry is seen as an aspirational target, if all of the latest technology is aggressively employed in their “Go-Getter” case. BC’s reported fugitive emission rates—which rely on self-reporting by operators and by modelling studies conducted by CAPP, an industry lobby group— lie outside even the wide ranges reported in the American studies and should be viewed with scepticism until they can be corroborated by independent studies. From the report Clearing the Air showing actual and projected GHG emissions from the US gas industry. 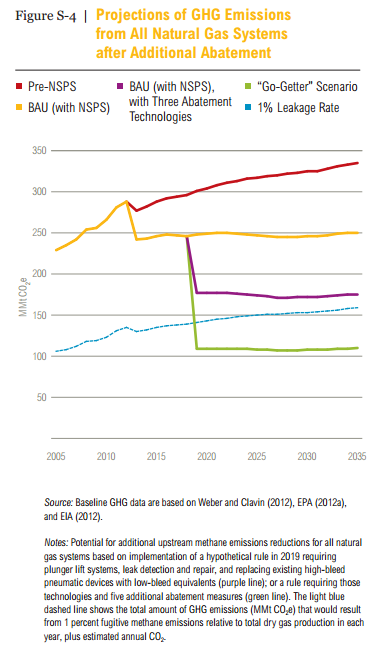 The blue dotted line shows the calculated emissions assuming a 1% leakage rate, a target that can only be achieved in 2020, with the aggressive adoption of new technologies. Contrast this with the current estimated 0.3-0.4% leakage rate estimated for BC’s oil and gas industry. A comprehensive review of the recent literature on fugitive methane arising from natural gas production and distribution in the USA is available at Skeptical Science. This entry was posted in Uncategorized and tagged BC, LNG, Methane, Politics. Bookmark the permalink.